Manolo says, in honor of the Manolo’s recent visit to the too precious for words Carmel, the Manolo presents to you these delightful woven leather skimmers by the BCBG Max Azria which bear the name of the Carmel. These would be suitable for wandering through the fairy-tale streets, looking for your own Clint Eastwood/Prince Charming. This entry was posted on Tuesday, July 31st, 2007 at 11:50 am by Manolo the Shoeblogger and is filed under Flats. You can follow any responses to this entry through the RSS 2.0 feed. Both comments and pings are currently closed. About these shoes: I have a similar shoe by BCBG. It’s a woven ballet flat, with a bow on the toe instead of the flower. They are really, really comfortable, and the best $150 I have spent in a long time . . . the feel good, and they are cool. I recommend them. And NO, I didn’t get a stipend for the company for endorsing the shoe. If you’re in doubt, I say go for it. WOW! The Manolo was in my neck of the woods (well, kind of. Big Sur is about 3 hours south of where I am). Oh, and those shoes? DARLING! 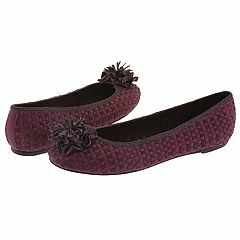 I have a similar woven ballet flat by BCBG, with a bow on the toe instead of the flower. They are really, really comfortable, and since they’re woven, they’re quite airy and cool. The best $150 I have spent in a long time. The Carmel, in addition to being charming beyond belief, is also a very dog-friendly destination.